Bathukamma is the floral festival (Cultural Festival of Telangana) celebrated by the Hindu women in the Indian state of Telangana. The festival is celebrated for Nine Days. 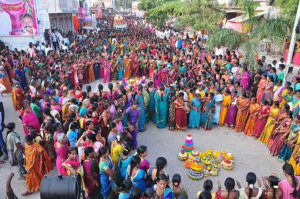 Bathukamma festival is celebrated for Nine Days. The festival is followed by Boddemma, it is celebrated two days before the Bhadrapada Amavasya and it marks an ending of Varsha Ruthu (Rainy Season). Bathukamma is a beautiful stack, arranged with different seasonal flowers in concentric layers. Goddess Gauri is worshiped in the form of Bathukamma for these nine days. Last day of the festival is celebrated on Ashwayuja Ashtami Tithi. The day is called as Durgashtami. Dussehra is celebrated on the second day after Durgashtami, i.e, on Ashwayuja Dashami (Tenth day in Ashwayuja month, is called as Vijaya Dashami. The Women gathers and celebrates the festival all the nine days by singing and playing around the Batukamma in traditional dresses. This floral festival starts on the Bhadrapada Amavasya day as per the Amavasyanth calender. This day is also called as “Pethara Amasa“ in Telangana. It marks the starting of Sharath Ruthu (Autumn Season). Each day batukamma festival is called with a different name and each day different food is offered to the goddess. On Bhadrapada Amavasya – First day of Bathukamma is called as Engili Puvvu Bathukamma because first, they pay homage to their ancestors by way of food offerings and then they start making Batukamma. On Ashwayuja Padyami (First day of Ashwayuja Month – as per Amant Calendar) – Second day of Batukamma is called as Atukula Bathukamma. On this day devotees offer Atukulu as Naivedyam. On Ashwayuja Dwitiya (Second day of Ashwayuja Month) – Third day of Batukamma is called as Muddapuvvu or Muddapappu batukamma as Batukamma is made up of Mudda Chamanthi or Mudda Banthi flowers along with Thangedu Puvvu & Gunaka Puvvu. Also offer Muddapappu & rice as naivedyam. On Ashwayuja Trtiya – Fourth day of bathukamma is called as Nanabiyyambathukamma as devotees offers Nanina Biyyam (Soaked Rice) & Jaggery. On Ashwayuja Chathurthi – on this day of Batukamma is called as AtlaBathukamma. The women offer Atlu (dosa or roti type of food) as naivedyam for the batukamma hence name called. On Ashwayuja Panchami – No Naivedyam preperation on this day. It is believed that Goddes Gowri was felt hurt. The day is also celebrated as Lalitha Panchami. On Ashwayuja Sashti – This dayis celebrated as Durga Sashti. Naivedyam is offered in the shape of Vepakaya (Nim/Neem Fruit), so this day is called as Vepakayala Batukamma. On Ashwayuja Sapthami – Eighth day of bathukamma is called as Venna Muddala Bathukamma. On this day devotees offer Navedyam with butter. On Ashwayuja Ashtami (Durga Ashtami) – Bathukamma festival called as Saddula Batukamma or Pedda Batukamma. On this day Batukamma is made up of different flowers in big size than all the eight days. Food offerings to Goddess – 5 types of rice & 1 sweet is offered on this day. **Offerings may vary region wise but in most of the regions, devotees offer these foods.